A full year past, we reflect on that which once was, that which persists, that which may be. Lilly McElroy’s second solo exhibition at Thomas Robertello Gallery honors 2009, a year that, for many, typifies economic unrest, unemployment and home loss. Even for those of us unscathed, a new year carries new possibilities, new responsibilities, and McElroy urges us to reflect on a year’s worth of hardships with the quips of another. She set up a website (aroughyear.com) to solicit others’ images, stories and jokes that epitomize their most painful moment, or in some cases, their triumphant reclamation. 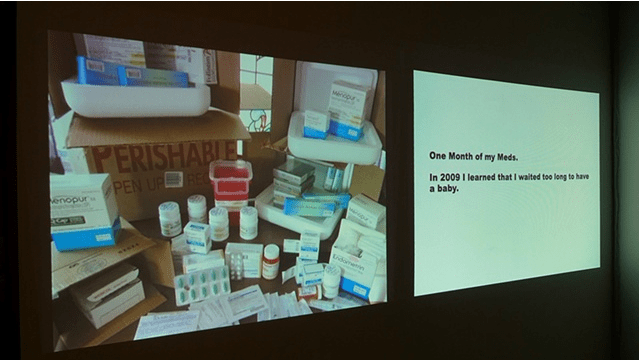 McElroy describes her artistic mission as an interactive attempt to make a connection with her audience, and she is accustomed to participatory art. Her inspiration for soliciting photographs, she says, may have emanated from a past project for which she asked her mother to photograph twenty-four reasons why she loves her, using nothing more than a disposable camera. McElroy spread the word of her developing project by posting ads in Craigslist and Coffee News, distributing flyers to cafes, “emailing anybody who had ever emailed me about anything,” she laughs, and even snail-mailing strangers chosen at random from old phone books. “I got a lot of responses asking who I was,” but her breadth of personal connections and that of friends and family catalyzed the project’s dissemination, fashioning a potent spiderweb chronicling a year in the life. With the exhibition of McElroy’s archive, another is coming into being. Jason Lazarus is asking people to anonymously donate photos that are “too hard to keep,” tarnished by lost love or weepy memories, which he is re-presenting on a website (toohardtokeep.blogspot.com), without commentary. Both McElroy and Lazarus are keenly tapping into the communal melodramas and confessionals that so vividly trigger pathos on television. 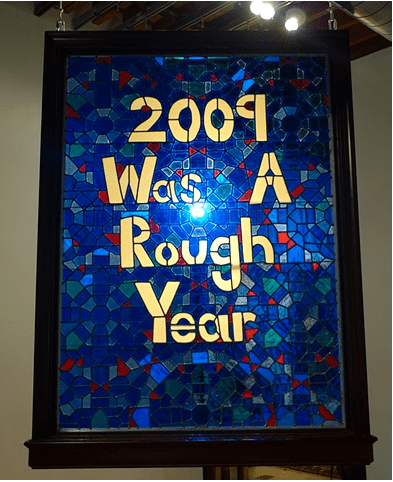 At the gallery, the central point of McElroy’s exhibition is a deep-blue stained-glass window, inscribed with the lightly golden “2009 Was A Rough Year,” hanging from the ceiling, illuminated by a spotlight that disperses the message throughout the room. The four-by-six-foot window is McElroy’s response (“me acting as some sort of weird filter”) to the images and stories she received. “I wanted to segment it but make it feel complete, the light patterns on the wall separated from the slideshow, have it bleed together a little bit,” explains McElroy. Through January 29 at Thomas Robertello Gallery, 939 West Randolph.